So wrote Horace in his Odes III, predicting the far reaching influence of his (and his contemporaries’) work on the coming centuries. Horace was one of a number of talented poets including Ovid, Virgil, Livy, Propertius, and Rufus, who flourished during the Augustan age of Latin literature (ca. 42BC to 17AD). When a group of aggrieved aristocrats murdered Julius Caesar in 44BC, they hoped to restore the freedom of the Republic. Instead, years of civil war followed, culminating in Rome’s first emperor, Augustus. These years of social, artistic and architectural change resulted in many Classical literary masterpieces which shaped the future of European history and culture. In X.d.732, a 17th century manuscript of a drinking song, we see evidence of this legacy. At first glance the manuscript appears to be solely about drinking and revelry. There are eleven verses, each ending with lines in Latin. A closer look at the Latin, however, reveals links to the three major Augustan poets: Horace, Virgil, and Ovid. This in itself is not surprising in the 1600s, but the brevity in which these poets are called to mind (tucked away within the lines of a rowdy drinking song) is interesting. The first Latin we come across is four words of Horace in line 4, at the end of verse 1. These words are from Epistles I, 5, line 19. The full line in translation, retaining an original spelling of ‘disertum,’ is whom have not flowing wine cups made eloquent? (fecundi calices quem non fecere disertum). The epistle takes the form of an invitation from Horace to his friend Manlius Torquatus, asking him to wile away a summer’s evening over dinner at his farm. Earlier on Horace says we are permitted to spend a summer’s night in kind, pleasant talk, without worry (impune licebit aestivam sermone benigno tendere). He also reminds Torquatus that it is the feast of Caesar’s birthday, so they are free to relax! Horace often wrote about his love of wine. As well as extolling its virtues in this epistle, he sings its praises in Odes III, 19 and Odes III, 21 where he calls his wine jar faithful (pia testa). Assuming the intended audience was Classically trained, then they would know the meaning of these four words in context. Their use here praises the good life and the simple joys of a night out with friends. They admire Horace and his Epicurean beliefs. We encounter a second Augustan poet at the end of verse 3 with words from the opening line of Virgil’s Eclogues I. The Eclogues are conversations between herdsmen in mostly rural settings, coping with the vicissitudes of a revolution. Again, the hexameter is incomplete. The full line is You, Tityrus reclining under the covering of a wide spreading beech tree (Tityre- tu, patulae recubans sub tegmine fagi). Missing from the drinking song is Tityre- tu, patulae. Tityre-tu in Virgil is a vocative address to the shepherd Tityrus, who is the character Meliboeus is speaking to. 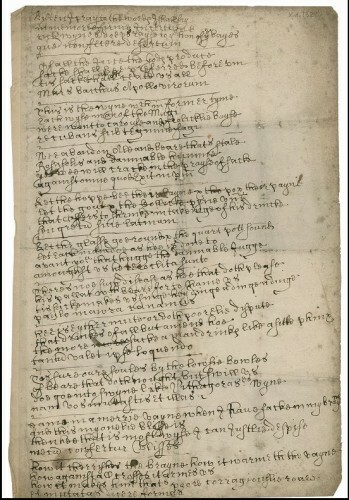 From 1623, the OED has a listing of tityre-tu as “One of an association of well to do roughs who infested London streets in the 17th century.” This drinking song perhaps prompts ties to this ‘Tityre-tu’ group, through the deliberate omission of the words. In verse 7 we return to Virgil and part of the first line of Eclogues IV. Written about two years after Julius Caesar’s death, in the midst of the worst bloodshed, Eclogues IV predicts the dawning of a golden age. It provides comfort by the promise of a coming peace. In line 10 of the Eclogue, Virgil writes about this peace as when Apollo rules. Later, when Augustus is emperor, he ‘adopts’ Apollo, the god of sun, poetry and healing. He dedicates a temple to him in Rome, with direct access to his own house, and thanks him for the victory over Mark Antony and Cleopatra. Apollo, along with Mars, god of war and Bacchus, god of wine and fertility, are also mentioned in the drinking song at the end of verse 2. Emperor Augustus was a shrewd politician, engaging his friend Maecenas to foster a literary circle to write polished verse in his favor. Horace’s Odes I, 2 hails Augustus as the savior of the state. Virgil’s Aeneid has carefully crafted genealogies which link Caesar to Aeneas, the founder of Rome. Aeneas’ mother is also Venus, which expertly sets up Augustus’ rise to power as an inevitable destiny, determined by the gods. Ovid may be the greatest Augustan poet, with the most lasting imprint. After quotes from Horace and Virgil, and knowing of the Augustan poets’ fondness for inter-textuality, we do expect Ovid next. Sure enough he arrives in verse 8 with line 12 of Metamorphoses XIII. The Latin references become more serious in tone as the song progresses. We arrive in the midst of the Trojan War, as depicted by Ovid in the Metamorphoses. Ajax is comparing military might with oratory. Ajax declares he is as powerful in the fierce conflict of battle, as that man (Odysseus) is powerful in speaking (tantum valet iste loquendo). The manuscript swaps the original that man (iste) for himself (ipse). The name Ulysses/Odysseus (Vlisses) at the end of verse 10 reinforces the idea that oratory is the most valuable asset in war. The final lines of verse 9 and 11 are reserved for the grand opening of Metamorphoses I. Verse 11 ends and to speak of changing forms (et mutatas dicere formas). This is taken from the important first line of the Metamorphoses. At the beginning of Metamorphoses I, Ovid tells us of new bodies birthed from chaos and of the raw confused mass which comes before order. There needs to be chaos for change to occur. Is this drinking song an ode to wine and friendship or is it a nuanced Classical commentary on how to cope with the turbulence of the 17th century? Is it a nostalgic look back to the Augustan golden age, or a toast to the desire for a new golden age? Does it want us to believe the course of history is predetermined, so we should relax and enjoy life? Or is it telling us to seize the day (carpe diem) and alter history? We start with Horace inviting his friend to a simple dinner and a sup of wine. We end with Ovid on changing forms and the chaos of a new world taking shape. By using examples from the history of Rome, this song holds a mirror to the current times and attempts to elevate them to a golden age, no matter how bloody. 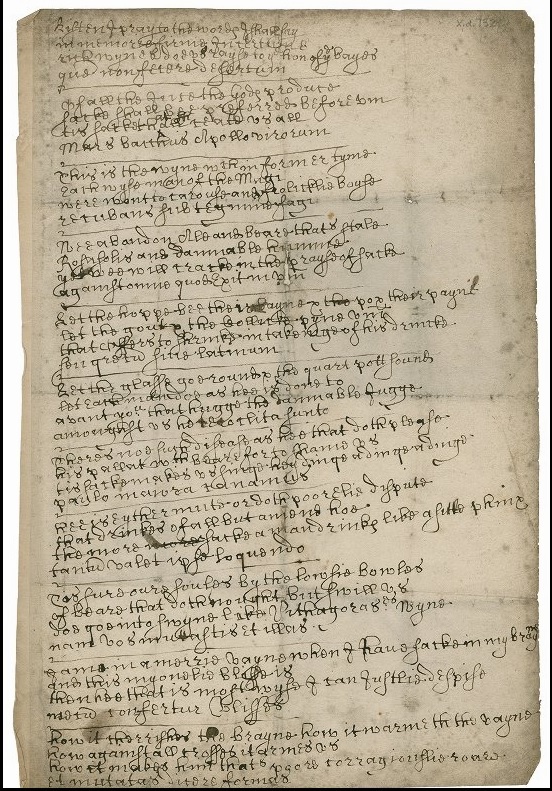 Sarah Powell is the EMMO Paleographer at the Folger Shakespeare Library. She first fell in love with manuscripts studying Latin at Trinity College, Dublin. She likes her transcriptions served with a cup of Yorkshire tea.